TechnipFMC has been honoured with an OTC Spotlight on New Technology award for its Subsea 2.0TM In-Line Compact Robotic Manifold design. The company’s Subsea 2.0 In-Line Compact Robotic Manifold has transformed the traditional manifold design to improve subsea field development economics. The compact manifold design reduces size, weight and manufacturing cost. It incorporates a robotic arm for valve actuation, can be installed using the same vessel laying the flowline and increases the flexibility for CAPEX spend over the life of the field. The product is designed to be half the size and weight of its conventional counterpart and reduces cost and delivery up to 30%. In addition, its production schedule can be compressed up to 30%, providing faster time to first oil and return on investment. The new compact manifold integrates all the functions of the conventional manifold pipe work and structure into a few cross drilled blocks with integral valve cavities and common interfaces to bolt on the branch and header hubs. All hydraulic functions have been eliminated to further reduce the complexity through the use of manually operated valves. The result is a simpler manifold that can be produced with 10-times fewer parts and requires no structure for support or lifting. Furthermore, production of manifolds now shifts from a customised project design to a modularised, configurable product that enables true standardisation and industrialisation. The leaner, smarter design eliminates the fabrication complexity of welded pipe, bends, fittings and other structures. Its compact size and in-line feature offer more installation options and flexibility throughout the life-of-field. The manifold can be installed together with the flowline by the same pipe-laying vessel, saving the need for a purpose-built heavy lift vessel. The In-Line Compact Manifold is optionally coupled with an integrated robot that operates the manual valves assembled into the block. The Robotic Valve Controller is an all-electric system operated by the topside master control station. In the same way, the valves can be manually, hydraulically or electrically actuated. 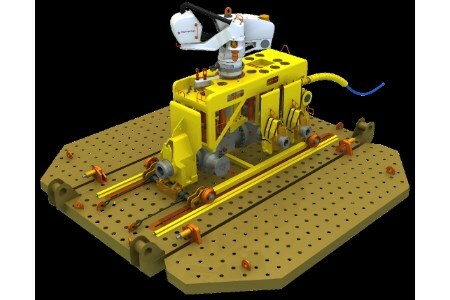 The In-Line Compact Robotic Manifold design is consistent with its complementary products in the TechnipFMC Subsea 2.0 platform. Coupled with the compact tree, next-generation controls, flexible jumpers and integrated connectors, the goal of reducing the total system size, weight and complexity while moving to a more modularised design is now reality. The end result are products designed to enable predictable execution with reduced risk while decreasing engineering hours and delivery schedules.